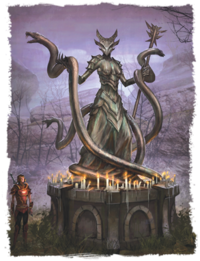 Vaermina is an enemy of Ebonarm, Boethiah, Peryite, and Hermaeus Mora, but is allied with Sanguine. Her summoning day is the 10th of Sun's Height. Although historically it is Molag Bal who contrite vampires turn to for relief from their curse, Bal must solicit Vaermina for the actual cure, though the particulars of this transaction are unknown. In 16 Accords of Madness Sheogorath taught Vaermina about the importance of madness for dreams. The Skull of Corruption is Vaermina's signature artifact. It is an incredible staff that creates a duplicate, or "clone", of whomever it is cast upon. This clone then attacks the original at the behest of the caster. Legends say that the staff has a mind of its own, and can feed on the memories of those around it. Esta página foi modificada pela última vez à(s) 17h28min de 6 de abril de 2015.